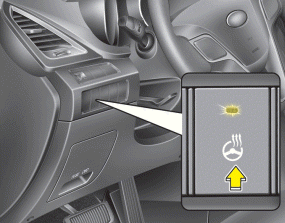 With the ignition switch in the ON position, pressing the heated steering wheel button warms the steering wheel. The indicator on the button will illuminate and notify you on the LCD display. To turn the heated steering wheel off, press the button once again. The indicator on the button will turn off and notify you on the LCD display. The heated steering wheel will turn off automatically approximately 30 minutes after the heated steering wheel is turned on. Do not install any grip to operate the steering wheel. This causes damage to the heated steering wheel system.